Its just a few days to the Amsterdam International fashion Week, but of course we have already seen some designs in the designer presentations that have been made in Florence, Milan and Paris. If we are to believe what the male fashion for summer 2013 will bring, its among others male legs! 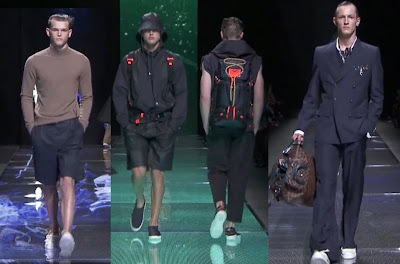 Some top designers like Mugler, Viktor & Rolf, Raf Simons and Louis Vuitton have shown their men-collection for summer 2013, and short pants are going to be the norm! Louis Vuitton did it in an almost old-fashioned way, with nautic themes: Blue, and white marine like colours, knitted pullovers for the cooler summer evenings and here and there a bright yellow coat. Kim Jones, with Louis Vuitton responsible for the male fashion line, definately went back to the eighties and made sure it was all wearable and not over the top! Belgian designer Raf Simons Made more of a fashion statement: combining daring prints with no-so-out-of-the-box combinations of oversized and tall, almost dress-sized shirts with short trousers, definately brought a feminine touch to its collection for 2013. The collars were high-cut or alltogether gone. 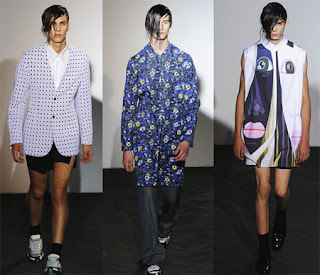 But he too decided in a way to go back to the eighties: The punk-like hairdress of the models as well as the feminization of the male, all well remembered from bands like The Cure The Cult and Culture Club is suddenly back again! 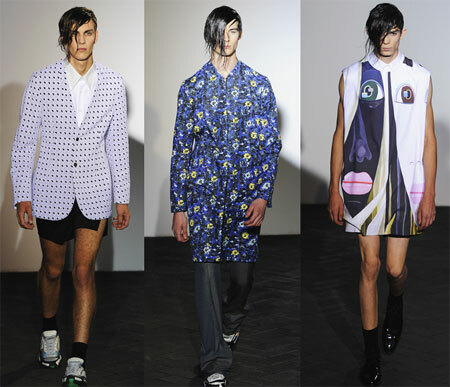 But Nicola Formichetti, Thierry Muglers Creative Director is definately the one that pushed the envelope when it comes to daring design for next year. Nicola combines blazers with short trousers, front-open short trousers and even pantyhoses for men! Lets see what Amsterdam will bring next week!